Lets put aside all the fluff when it comes to Thanksgiving. Lets not think about Black Friday, Football, the specific family member you don’t like. Thanksgiving is such a wonderful time of year without all that stuff, let’s try and remember that. 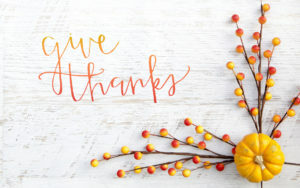 I’ve done some research and have found some nifty ideas that we can all implement into our thanksgiving’s to bring back the basic meaning of the holiday. So with out anymore delay here’s number one. Lets take the time to remind ourselves of the blessing this year has given us. Take a moment to say to yourself at least 10 things that have happened to you this year that you’re thankful for and don’t stop until you get to 10. 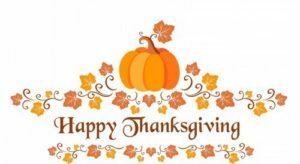 Then say 5 more things you’re always thankful for, like friends, family, your spouse etc. For a grand total of 15 things you’re thankful for. Doing this the moment you wake up Thanksgiving day will make you appreciate this day even more. A cute idea for when your friends and family come over is to have a jar or basket, it’s up to you and having them write down something they’re thankful for then placing the paper into the jar for later. After dinner everyone can select a paper and read it out loud, its nice to hear what everyone else is thankful for. I persoanlly do not cook during Thanksgiving, my family might bring drinks or the dinner rolls to my grandma’s house. So if you’re like us, try making something and participating in the fun. 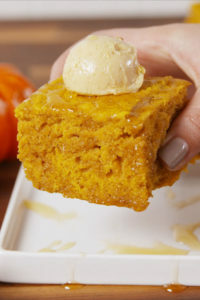 I’m personally going to try to make a pumpkin cornbread, stuffing, or a green bean casserole. I’m undecided still. Click here for the ideas. The picture is from the website “delish.” Click the picture to be directed. If you’re a crafter you’ll love this! 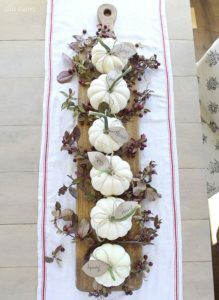 Making a center piece for the table is a great way to bring some more love. Especially since you made it, your whole family will love it and the fact it came from you. Here is a website it found with a bunch of easy ideas click here for it. PT2: Here are some ways to show your appreciation to your family on Thanksgiving. Being late in general is wrong, but on Thanksgiving I wouldn’t dare do it because I’ll be hearing about it all night long. So get there on time and maybe even a little early to help set up. The phone is such a distraction, so try turning it off when you get to your families house. If you’re house hopping, just turn it on when you’re ready to leave, its that simple, don’t over think it and don’t worry, who ever is trying to contact you will be there in a couple hours. Sitting down and talking for 10-15 minutes or even just listening will make their whole week. Your elderly relatives have so much wisdom to share so listening to them will make them happy and you might even learn a thing or two. Don’t just stuff your face, watch the game and forget about the dishes, someone needs to help with that. So make it a priority to help this year. Bring your plate and maybe your little cousins plate to the kitchen to be cleaned, help dry some plates, anything you do to help will be noticed and highly appreciated. Thanks for reading! I hope this gives you ideas to bring a little more to the table (hehe, get it?). Send me a comment on what you think and if you do anything I’ve suggested, I looove hearing from you guys. I also won’t be writing next week considering it’s a holiday so I’ll see you guys in December! It’s my blog and I’ll write when I want to.